Over a 30 year span. I was determined to make a living on the water. I proved it could be done, but it took dedication, determination, imagination and some luck. I began my nautical career running charters for salmon and trout fishing on a 6-passenger, 32-foot, fly-bridge Trojan cruiser on the Great Lakes. I moved on to run charters for perch fishing and cruises on a 35’ steel-hulled Safety Craft that carried up to 28 passengers. Among my many efforts on the water, I operated a marine towing and salvage business utilizing three Boston Whalers. Along the way, I even managed to have a little time left for pleasure boating with a variety of craft on the ocean. I watch and continue to observe changes in the marine industry. I have been fortunate to enjoy the opportunity to participate in the changes by product testing. Downriggers, PFD’s, paints, electronics, and most recently fenders (see HB August issue) are among some of the items I have tested. The most important thing I discovered from testing a wide variety of new ideas was, less than half the items actually came close to my expectations or the promotional material I was sent hailing them as the greatest new products to hit the market. One of the items I tested repeatedly was VHF radios because my commercial, charter vessel required I have two radios aboard. I purchased them on a guaranteed return basis because some are very expensive. This was a good plan because the most expensive radio’s, with all the fancy gadgets, were often out-performed by less expensive brands. A couple of years ago, I tested an inexpensive Uniden, Model 535. It did not scan but was low cost, less than $ 125.00. It out performed my expensive model that had a scan feature and all the other fancy accessories. It had greater clarity and transmission than the more costly radio. When it was time to replace a radio, I chose an Icon, Model M402S over many more expensive ones at a cost of only $ 159.99. It was loaded with features including the new emergency DSC. When the salmon and lake trout charter industry was in its infancy on the Great Lakes, I tested downriggers that had to be hand cranked. There were four or five manufacturers of the manual models. As the industry grew, electric models were introduced and I received two motors to convert my manual equipment with and a request by a developer to test them. The Cannon downrigger motor I tested turned out to be one of the very best ever made. I soon had five of these electric marvels on my charter boat. 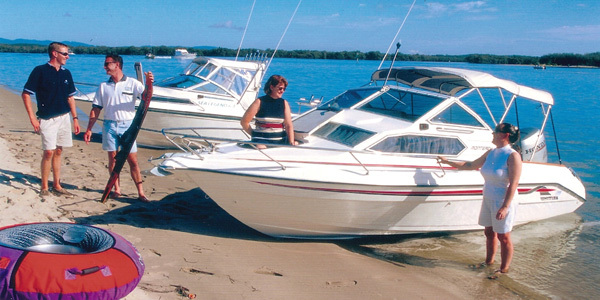 They were the first manual downrigger and first electric model to meet my expectations. Their product was so well designed that today, over 20 years later, they are still a leader in the industry with few changes while many others have gone by the wayside. One testing endeavor that did not go well was anchors, a most important piece of equipment on any boat. Although anchors can be called on to hold a boat in rocks, mud, sand, coral, and grass, the quest to make one that holds in all conditions has been a challenge since the beginning of boating. Few anchors hold in all bottom conditions, many that hold in heavy seas become lodged in the bottom and are near impossible to retrieve. After testing many various anchors over the years, I found one that holds well in all bottom conditions. It’s a plow-type anchor called Hydrobubble. It always lands plow down on the bottom yet if buried in rocks, mud or coral, a quick jerk straight up releases the shank at the plow blades and it can easily be retrieved backwards. I’ve tried hard to bury it but have been able to retrieve it with little effort. After 25 years of testing dozens of makes and model anchors, this is the first one to pass my tests. Paint is another product I’ve tested extensively, mainly bottom paint on wood, glass, and steel. I was very disappointed to find that every bottom paint did not work on every surface and many would perform as advertised in some water but not as well, or at all, in others. One company provided what was said to be an “environmentally safe” product. They claimed, if properly applied it would last multiple seasons. This was a water-based wonder of chemicals and “the answer to an age-old search.” Unfortunately it was the wrong answer. In less than 60 days the paint washed off of fiberglass and rusted off of steel even though all sealers and coatings recommended were applied properly. The product was a dismal (and expensive) failure. As I began another “wonder” bottom paint test, I hesitantly prepared the bottom of a fiberglass boat with Interlux, Micron CSC and again coated exactly as suggested by the manufacturer. Although I felt a longer drying time was needed between coats, once the application was completed, the paint lasted four years on a fiberglass boat used in both salt and fresh water without re-coating. Another Interlux product far surpassed all others I had used on my steel hulled charter vessel the past twenty years. Interlux 2000-2001 is an excellent sealer when repairing fiberglass blisters and makes a great undercoat on both glass and steel. During my years of testing, I encountered a new design for a small boat. It had multiple uses, you could sail it by simply making a few adjustments, convert it to a rowing shell or operate it as a motorboat. The testing this product provided hours of aching muscles from rowing and swimming (after being dumped overboard) when I attempted to sail it. The design was a dismal failure and soon left the market place. As a safety advocate, I frequently test lifejackets (HB May issue). When new products such as the inflatable PFD’s were introduced, I tested them. It was a shock to me to learn a product name, well known as one of the best on the market, had released one of the most dangerous PFDs ever sold. Fortunately my testing, with the assistance of an expert team, and the cooperation of the PFD manufacturer, resulted in an immediate recall. The most comfortable inflatable I tested was Sospenders now marketed by Stearns. All of the various inflatable PFD’s are expensive and require vigilant maintenance. I do not recommend them for the casual boater. I would like to suggest when considering the purchase of a new product, be sure to keep any warranty claim paperwork. If possible, find someone that has tried the product and ask his or her opinion before making your purchase. A well known, highly advertised brand name is not always the best choice.